An event is for example an appointment, meeting or birthday in your calendar. Click New event in the top left corner, or double click in the overview in Day, Week or Month view. Select the calendar that your new event should be created in. Enter a Subject (title) that will be visible in the overview. Enter a description for the event. It will be visible only if you click on the event. Select when the event starts and ends. If the event lasts the whole day, check the box for All day event. Click Save to create the event in your calendar. 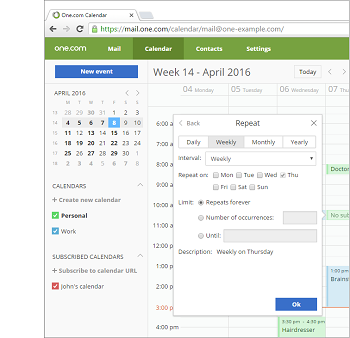 You can also create recurring events, for example a birthday or a weekly meeting. Follow step 1-6 like described above. Check the box for Repeats. A new window opens where you can choose recurring settings. Select the interval of the event, daily, weekly, monthly or yearly and choose any additional options. Set how many times it should repeat or until which date. Click Ok to go back to the previous window. Click Save to create the recurring event in your calendar.